I loved this dystopian novel. It was an absorbing read... I can't say that I read it quickly, but rather, it pulled me in to the universe so completely, that I found myself devoting a nice solid five hours or so to solidly reading through this imaginative journey into a dark future. Much like the heroine Katniss from The Hunger Games, Deuce, the star of this book, fancies herself a tough, unemotional sort, who lives for the hunt. Her underground home, about the size of a tiny village, is situated in an abandoned New York city subway station. To eke out their meager existence, the community lives by rigid roles which define one's status in the social stratum. Physically capable Hunters, obviously, provide food for the community. Beautiful and smart, Breeders are tasked with birthing and raising the next generation. Intelligent yet ugly Builders are in charge of what little remains of their technology. Children are raised in creches, and are referred to by a number until they "earn" their name in a coming-of-age ceremony where they receive scars showing their place in the community. Their fierce protectiveness of each other is only reinforced by the constant dangers... they are told above ground is a nuclear wasteland, and they are hemmed in by what they call "Freaks" sharp-toothed, zombie-like creatures who will feed on any humans they can catch. The day that Deuce is officially raised to Huntress is the happiest day of her life, until she is paired with Fade, an outsider taken in by their clan who is still mistrusted by many. In a way, Deuce's loyalty and optimism are what undoes her, as she is very, very shocked when certain misdeeds of the elders come to light. When she thought her enclave was trading fairly with other groups, in fact, they have been taking things by force. Innocent citizens have been framed for hoarding, a crime punishable by banishment and certain death. Unable to stay, she and Fade set out for aboveground to try their luck. The novel becomes a story of travel, adventure and survival as she and Fade make their way across a ruined cityscape with Freaks, also known as Eaters or Muties in hot pursuit. They have their hands full fighting off rival gangs of humans, who are just as vicious but more cunning than the Freaks. As Hunters, they are forbidden from forming romantic attachments, but now that their lives in the enclave are behind them, they do start to develop feelings for each other, and a large part of the story is Deuce's struggle to overcome her aversion to romance. Interestingly, Breeders are a somewhat privileged position - they lead relatively soft lives compared to others in the enclave, and not everybody is allowed to have children. The enclave has a somewhat rudimentary understanding of genetics, and know that they want to have the healthiest children possible. But at the same time, Breeders are looked down upon, especially by the Hunters who consider themselves elite. As a lifelong vegetarian, I found the importance of hunting meat pretty overstated in this book. It seems that everyone in the enclave survives on a diet consisting solely of meat from small animals and the occasional mushroom for flavor. Wouldn't such a diet make one incredibly ill? Well, duh, with lifespans maxed out at 45 or so, and many people passing away in their late 20's, poor nutrition could definitely be to blame. The Freaks reminded me of the zombies from The Forest of Hands and Teeth, although no one seemed to exhibit an understanding that they were mutated plague victims -- former humans. The underground enclave, and the characters' dependence on ancient canned food reminded me a lot of The City of Ember. Despite the nondescript steel door cover, I think dystopian fans will flock to this book. Honestly, I had planned on skipping this book until I saw the incredible book trailer for it. I'm glad I gave this book a chance, and I'm now looking forward to the sequel. Great review. You made me want to read this book. Especially if it's anything like Forest of Hands and teeth -- loved those zombies! Thanks! This was already on my list of to-read. Glad to hear such a great review of it! @Annette It's not as lyrical or as somber as the Forest of Hands and Teeth. It's definitely more action-driven and faster paced. LOL! Thank you for mentioning the food! I have no problem with eating meat, but I couldn't help wondering why they weren't all falling ill with scurvy or similar illnesses. That said though, I really enjoyed Enclave. I've only seen the movie of The City of Ember, but I got a similar vibe when reading about Deuce's community. Very enjoyable review. Thanks! I thought it was interesting that they liked the canned cherries, but hated all the other canned vegetables they found. Yes! So happy you enjoyed it! 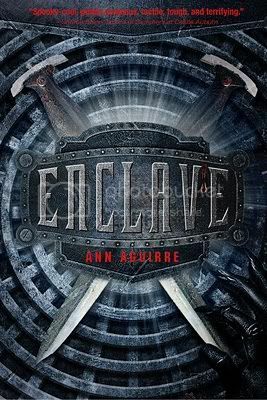 I'm pretty sure I first heard about Enclave when you originally posted the trailer, and it has ended up being one of my favorite books this year! !